In the rain forests of Xishuangbanna, all the plants are so exuberant, and the foliages shade everything. However, have you ever imagined that there are still life-and-death "class struggles" in this quiet kingdom of plants? Willow fig tree is a typical killer in such white-hot battles. Willow fig tree is a sort of tall arbor tree. It can grow as tall as 20 meters with a thickness of 30-50 cm. In the rain forests, it often rules a region through killing and replacing the plants it parasitizes. When small animals carry its seeds to the forks or cracks of other trees, the seeds would shoot up. Young willow fig tree can produce errant roots, just like epiphytes; as the fig continues to grow, its errant roots will cross or mix together and pack the plants it parasitizes on tightly, and it will rely on the trees it parasitizes on to support its body. When it grows up and becomes a big tree, its roots and stalks have wrapped the tree it parasitizes on completely. But, the parasitized tree, because of its transmission tissues are choked and the shortage of nutrition, will die away; while the fig itself will become a big tree independently. We can often encounter oil palm(Elaeis guineensis Jacq.) strangled to death by figs in Xishuangbanna. After the oil palm decays, the willow fig tree becomes a natural craftwork: in the outer layer, its roots and stalks mixed with one another; but it is hollow inside. If we cut a section of the fig, plane it and smooth it up, it can not only be hanged in the reception hall as decorations, it can also be used as supports of flower basins or round tables. Besides, willow fig tree can also form ecological miracles such as "one-tree forest". It often stretches out many aerial roots from big branches; first, these roots are as thin as wires and would swing with the wind, as soon as they touch the ground surface, they will begin to grow very quickly in the earth; and they will gradually grow into column-like supporting roots, then spread towards all directions and form a "one-tree forest". 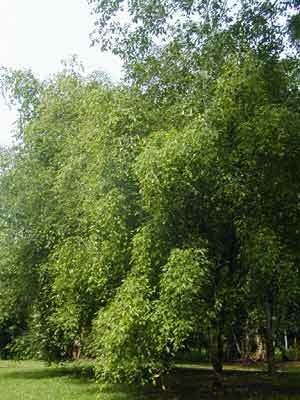 Willow fig tree mainly grows in Canton, Guangxi, Hainan, Yunnan, and Guizhou and it grows in humid shaws in-between el. 500 to 800. We can also find them in Nepal, Sikkim, Bhutan, Burma, Thailand, Vietnam, Malaysia, Philippine, and North Australia etc.